4th International Dyestuff, Pigments, Textile Chemicals, Digital Textile Printing, Dyeing and Printing Technologies Exhibition: Interdye & Textile Printing Eurasia which will be organized in cooperation with Turkish Textile Dyeing and Finishing Industrialists Association (TTTSD) and Artkim Fuarcılık will be bring together the leading companies of Textile Finishing and Textile Printing Industries together between 25-27 October 2018 at Istanbul Expo Center. 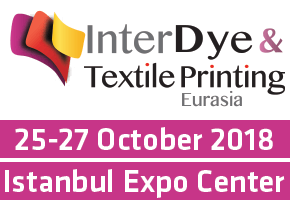 Dyestuff, Pigments and Textile Chemicals Exhibition Interdye and Digital Textile Printing, Dyeing and Printing Technologies Exhibition Textile Printing are being held concurrently between the dates of 25-27 October 2018 at Istanbul Expo Center. Both exhibitions’ visitor profiles consist of Textile Printing and Dyeing Industry professionals which gives the advantage of organizing the exhibitions together in order to create a momentum and synergy.